Whilst legislation may have progressed internationally and nationally for disabled people, barriers continue to exist, of which one of the most pervasive and ingrained is attitudinal. Social attitudes are often rooted in a lack of knowledge and are perpetuated through erroneous stereotypes, and ultimately these legal and policy changes are ineffectual without a corresponding attitudinal change. This unique book provides a much needed, multifaceted exploration of changing social attitudes toward disability. 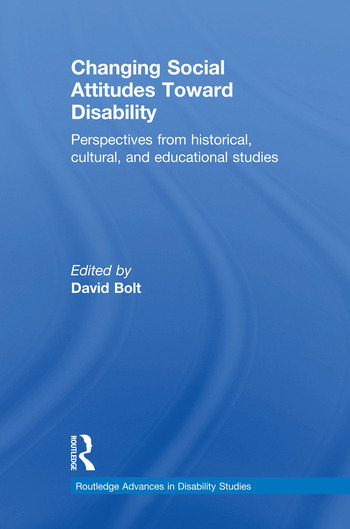 Adopting a tripartite approach to examining disability, the book looks at historical, cultural, and education studies, broadly conceived, in order to provide a multidisciplinary and interdisciplinary approach to the documentation and endorsement of changing social attitudes toward disability. Written by a selection of established and emerging scholars in the field, the book aims to break down some of the unhelpful boundaries between disciplines so that disability is recognised as an issue for all of us across all aspects of society, and to encourage readers to recognise disability in all its forms and within all its contexts. This truly multidimensional approach to changing social attitudes will be important reading for students and researchers of disability from education, cultural and disability studies, and all those interested in the questions and issues surrounding attitudes toward disability. David Bolt is Director of the Centre for Culture & Disability Studies, Liverpool Hope University, UK. He is a co-editor of the book series Literary Disability Studies, founder of the International Network of Literary & Cultural Disability Scholars and Editor-in-Chief of the Journal of Literary & Cultural Disability Studies. He is also co-editor of the book The Madwoman and the Blindman (The Ohio State University Press) and author of The Metanarrative of Blindness (University of Michigan Press). Dr Bolt is an editorial board member of both Disability & Society and the Journal of Visual Impairment & Blindness.